Confidence abounds. Last week, Investor’s Intelligence reported a surge in advisory sentiment to the highest bullish percentage since October 19, 2007. The National Association of Active Investment Managers (NAAIM) reported that the 3-week average equity exposure among its members increased to the highest level on record. We observe warnings from nearly every variant of overvalued, overbought, overbullish, rising-yield conditions that have accurately warned investors of oncoming market losses in a century of data, not to mention in real-time in 2000 and 2007 (see for example, my October 2007 comment Warning – Examine all Risk Exposures). As one of many historically effective variants of this syndrome, define “overvalued” as a Shiller P/E anything higher than 18 (given an actual multiple of 25.7 here, any objections to the Shiller metric are quibbles); define “overbought” as the S&P 500 at least 8% over its 200-day average, and just to be extreme about it – within 2% of a 5-year high; define “overbullish” as a 2-week average of bulls greater than 54% with bears less than half that level – below 27%; define rising yields as a 10-year Treasury yield higher than it was 6 months earlier. Prior to 2013, those conditions were observed only in June 2007 – about 2% from a bull market peak that would be followed by a 55% market loss; July 1999 – when optimistic investors could at least look for the S&P 500 to advance another 8% to the ultimate bull market peak in 2000, after which the market lost half its value – but not without a 12% correction between July and October 1999 first; the August 1987 pre-crash peak; the December 1972 peak, a few weeks before the New York Times quoted then-analyst Alan Greenspan saying “It’s very rare that you can be as unqualifiedly bullish as you can now” – immediately followed by a 50% market plunge; and (using imputed sentiment data) August 1929. The deeply unfortunate part of this story is that since early 2013, these strenuously overvalued, overbought, overbullish, rising-yield conditions have been observed not only in recent weeks, but also in May 2013, with a close call as early as February 2013. No material market weakness has emerged during this period, which encourages investors to ignore the risk altogether, rather than consider the likelihood that this risk is increasing, despite being unrealized to-date. With regard to the ongoing dispute about whether the recent advance can be characterized as a “bubble” in the traditional sense, our own case is detailed in prior commentaries – see in particular An Open Letter to the FOMC: Recognizing the Valuation Bubble in Equities. Meanwhile, I continue to believe that quantitative easing has no mechanistic relationship to the economy or the financial markets beyond creating a purely psychological discomfort with zero interest rates, and encouraging a reach for yield in speculative assets that has already set reckless extremes in median stock valuations, margin debt, and "covenant-lite" lending. Want to know the cause-and-effect mechanism that links QE to the economy? As FOMC governor William Dudley observed last week, so does the Fed. Our investment stance will change as the evidence does. In particular, we will have no stress-testing concerns in the coming cycle to prevent us from encouraging some amount of market exposure on at least a moderate retreat in valuations coupled with early improvement in market internals (as we easily accepted after the 2000-2002 plunge, for example - despite valuations that were certainly not compelling from a historical perspective, while arguing that "low consumer confidence is not a valid reason to avoid market risk"). We certainly don’t require a move to undervaluation (though we also would not rule it out), and we have no specific downside price target that the market must achieve. All that’s needed for us to shift to a constructive stance is to observe a set of evidence that’s actually associated with a positive expected return/risk profile. Such evidence has regularly emerged in market cycles across history (see Aligning Market Exposure with the Expected Return/Risk Profile). It bears repeating that our present investment methods would have encouraged a fully-invested or leveraged investment stance in about 52% of historical periods, with at least a moderately invested stance nearly two-thirds of the time. Our present level of defensiveness belongs to only about 5% of the historical record. That said, even our present ensemble methods (which reflect stress-testing and cross-validation against a century of market history) would have been fully-hedged about 60% of the time since 2000 – a period during which the S&P 500 has achieved an annual total return of less than 3.3% overall, with two intervening 50% losses. Also worth noting is that in historical data since 1871, there is only a single month prior to the late-1990's bubble when valuations were richer than they are today, based on either the Shiller P/E (S&P 500 divided by 10-year inflation adjusted earnings) or my old price/peak-earnings ratio (which takes record earnings at face value - but at least consistently so - by dividing the S&P 500 by the highest level of earnings achieved to-date). That month was August 1929. Valuation itself is not a useful timing tool, but a century of history goes against the delusion that present levels can be expected to produce positive total returns in the S&P 500 on horizons of less than 7 years. Importantly, the most reliable props that have historically allowed the market to turn a blind eye to valuation have been missing for some time now. Given the unfortunate resolution of similarly extreme overvalued, overbought, overbullish, rising-yield periods in history, it's almost mind-boggling that investors actually expect the present speculative run to end well. The accelerating pitch and shallowing corrections of the recent advance are worth noting. As I wrote about the oil market in July 2008 as prices raced toward $150 a barrel (see The Outlook for Inflation and the Likelihood of $60 Oil) “Geek's Rule o' Thumb: When you have to fit a sixth-order polynomial to capture price history because exponential growth is too conservative, you're probably close to a peak.” Oil prices collapsed as low as $35 a barrel shortly thereafter. The preceding advance to the speculative peak was very well-described by a “log periodic bubble” of the sort that characterizes the S&P 500 at present (see Increasingly Immediate Impulses to Buy the Dip ... or How to Blow a Bubble). 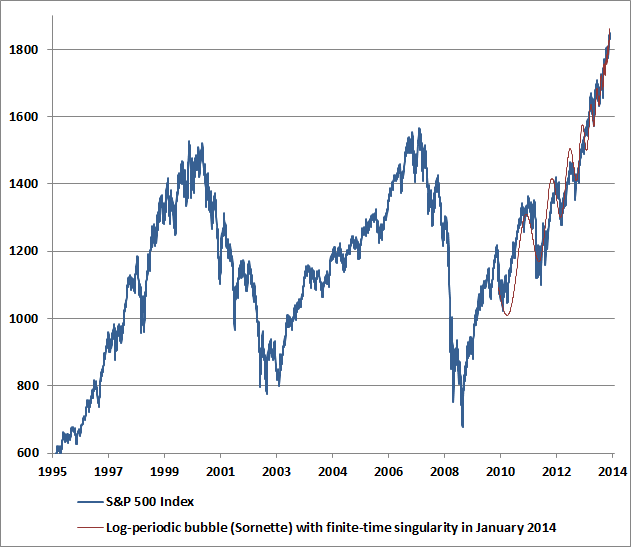 Based on the fidelity of the recent advance to this price structure, we estimate the “finite-time singularity” of the present log-periodic bubble to occur (or to have occurred) somewhere between December 31, 2013 and January 13, 2014. That does not mean that prices must immediately crash – only that the dynamics will then lend themselves to a great deal of potential instability, if prior log-periodic bubbles in equity and commodity markets across history are any indication. It bears repeating that our own defensiveness is driven by a broad ensemble of evidence, not simply price dynamics, not simply valuations, not simply sentiment, but the “full catastrophe” – which includes the fact that strong economic, speculative and monetary enthusiasm has historically been quite a contrary indicator for stocks. The chart below shows the current position of the S&P 500. The light red line shows the log-periodic price trajectory that most closely approximates the present overvalued, overbought, overbullish, Fed-induced speculative run since 2010. While the initial gains from the 2009 low until about mid-2010 represented what we view as a move from reasonable valuation to full valuation (our stress-testing “miss” was not on valuation grounds), I expect little, if any of the market’s gains since 2010 to be retained by investors over the completion of this market cycle. Despite very short-run uncertainties about market direction, I should note that we now estimate negative prospective total returns for the S&P 500 on every horizon of less than 7 years. On December 31, 2013, the Hussman Funds made the following year-end income distributions: Strategic Growth Fund $0.1107 per share, Strategic Total Return Fund $0.0141 per share, Strategic International Fund $0.0685 per share, and Strategic Dividend Value Fund $0.0212 per share. The Funds remain strongly defensive in the U.S. and international equity markets (though Strategic Dividend Value is limited to a 50% hedge against the market value of its holdings), and are modestly but not aggressively constructive toward Treasury bonds and and precious metals shares. As earnings season approaches, we expect the usual tendency for day-to-day fluctuations in the Funds to be affected by differences in weighting between the stocks held by the Funds and the indices we use to hedge. Particularly in the coming weeks, it will be important to recognize that modest day-to-day fluctuations in Fund value are not always an indication of the market exposure or hedging stance of a given Fund.